new and used Honda dirt bikes, what would you choose? The Small Saga of New and Used Honda Dirt Bikes. There is always a story for new and used Honda dirt bikes and a person can spend hours swapping tales about racing experiences with that brand. Durability and quality are one reason used Hondas keep their value. 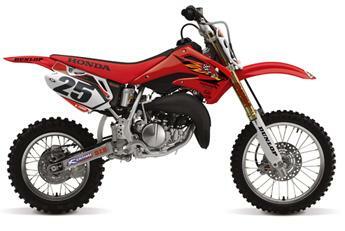 With the inventory of CRF450s nearly depleted, Honda made the decision to bring out a new, improved 2013 version. The delivery is good business sense, also, with other manufacturers doing the same. Passing EPA standards is a breeze. California has some of the most stringent requirements in the world and this lean, clean quiet bike cleared the hurdles with no need to change a thing. However, the new CRF450 uses the basic motor that has been on the bike for 10 years. If you are looking for more speed, adjust the pipes, airbox and jetting. That major increase in performance will deliver an incredible ride, plus add to the noise, produce a dirty exhaust and toss its legal status out the window. Be prepared to see two short mufflers instead of one. Honda engineers emphasize the way this change improves the center of gravity and increases engine performance while keeping the bike within its decibel limit. A rehashed concept, twin pipes adversely affected sales years ago. This will be a wait-and-see consumer reaction change. An upgraded electronic fuel injection and new style of frame, clutch and swingarm improve the performance and feel of the bike. It has a heavier feel than other 450 makes, but handles well, especially in the turns. The side-access airbox is easy to open. The new Kayaba pneumatic fork has no main springs, dropping 1.7 pounds from the weight of the bike. Honda's steering damper system eliminates the headshake and makes a comfortable ride. Accessories and performance parts are already available to turn the 2013 Honda CRF450 into a one-of-a-kind version. Pro X Valve Shim Kit or an NGK racing sparkplug boost the action. Rim decals add variety to the appearance. The engine runs hot, but an oil cooler kit keeps it cooler and extends engine life. The riding experience is great regardless of the terrain you choose. Do you like Honda bikes? Do you know where to buy them? Whats the deal about new and used Honda dirt bikes? They both have their pros and cons. NEW does offer warranties and the knowledge that no one else has damaged the bike, but you do of course pay full price. 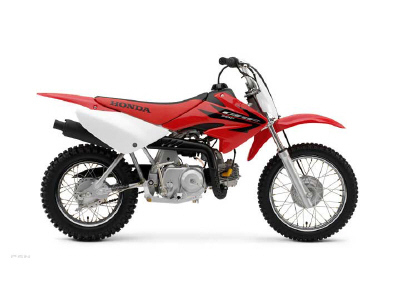 New and used Honda dirt bikes are great for the beginner. USED bikes are better for someone on a tight budget, as they offer great savings, the drawback is of course you need to check the bike over to ensure it hasn’t been damaged or abused. Take a test ride and check all the parts of the MX bike work correctly as advertised (if not - walk away). Are you a two wheeled fan? The extreme environments have opened up to the off road dirt bike over the past decade, and its cheaper than ever to experience them. But these places can take their toll on your new honda motocycle so maintenance is everything. If you buy the right motocross parts, and keep away from used parts (especially on items like brakes), you wont go far wrong. However this is a planet that loves the honda dirtbike; so lets find some great new & used honda dirt bikes along the way. Powersports.honda.com, sell new dual sport and off road honda racing bikes. Their first offering was a CRF230L. This is a street legal honda dirt bike, with a 223cc single-cylinder engine and a lightweight chassis. It also carries the Pro-Link® rear suspension system plus of course a tail light and turn signals light set supplied from the dealer. Starting at $4,999, this was a fine bike for sale. Next up was the XR650L – A honda bike starting at $6,499. A Baja-bred 644cc engine powers this classic honda. A light, rigid chassis combined with a long-travel suspension would be ideal on a mud track. This motorcycle store also sells the CRF450R, CRF250R, and the CRF150R plus a lot more models besides. Mxchange.co.uk have a plethora of used honda models that can be bought for repair projects or some cheap thrills. But both new and used Honda dirt bikes can be found here in great abundance. We first took a look at a Honda CR 500 selling for £1400. The motorbike has got brand new decals, new handle bars, plastics and tires. Also the motorcycle engine has had a complete rebuild plus receipts to prove it. 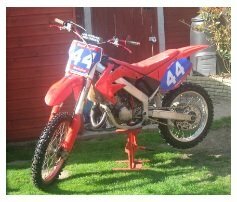 Then we found a Honda CR 125 (from 2003) in excellent condition selling at £1500. Being well maintained and dry stored, it came with maxxis tires, a chrome frame and custom graphics. Not bad for the money; and tons of honda accessory items and parts were included – such as a twin air filter, a fmf fatty pipe and an N-style seat cover. Bike-exchange.com is a similar site where anyone can place a classified advert for new and used Honda dirt bikes, (any brand of motobike crops up on this site to be honest). But today we were looking for new and used Honda dirt bikes. First up was a Honda CR125, going for $3800. Again it was dry stored, and the engine had only got 25 hours on it and never been raced. We like used motorbikes for sale; as you always get part(s) with the sale & lots of history. This seller was giving away with this model; renthal handlebars, a R-304 silencer, a pro circuit platinum pipe and brand new brakes & hoses (both front & back). Or for a cheap thrill try a Honda CR80, selling on bike-exchange for £495! Yes ok it’s a teens pitbike, but the engine has been totally re-built, and comes with a few honda accessories. The seller was being quite honest, as the bike needs a few new parts ( a kick start spring & a fender to be exact) – but for this low-money you will be required to do a little bit of maintenance. New and used Honda dirt bikes are fantastic fun. Used dirtbikes, and most honda parts will not be too hard to track down on the web. But some vintage motorcycle parts can be – so you will have to DO some digging. It’s astonishing that practically everything for a Honda can be got today, but price is where you have to be ultra-careful. 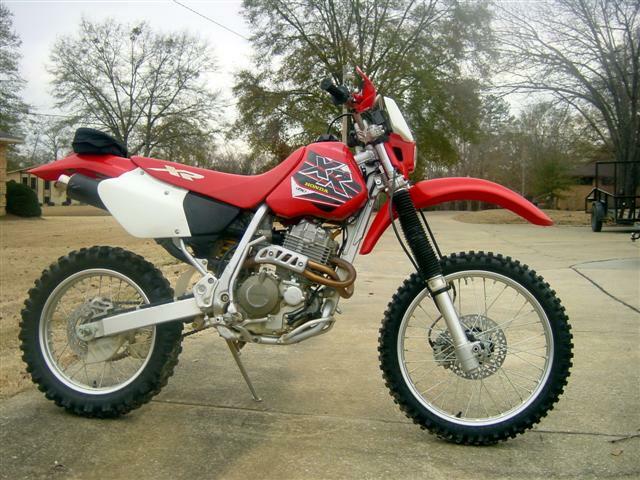 Used honda dirt bikes can be one of the best bargains you’ll get as a new rider. Honda's have tons of parts - which are well made, and the motocross bikes have all sorts of models for all kinds of riders. So you’ll never run out of choice. Plus they are affordable for the majority of us. The main thing is to work out what will be the main purpose of your bike ? Will it be for; the road as well as the dirt tracks? For jumps? Or for motocross races alone? and then make your mind up on which model to go out and buy. With so many riders of Honda motorbikes; there is plenty of advice around - so what are you waiting for go and get your new and used Honda dirt bikes ?